Today, on 26 March, the European Parliament voted in favour of adopting controversial upload filters (Article 13/17) as part of the copyright Directive. This vote comes after what was an intense campaign for human rights activists, with millions of signatures, calls, tweets and emails from concerned individuals, as well as Europe-wide protests. Despite the mobilisation, 348 Members of the European Parliament (MEPs) gave their support to the proposed text which includes concerning restriction to freedom of expression. Noticeably, 274 stood up with citizens and voted to reject upload filters. The proposal to open the text for amendments was rejected by five votes difference. The amendments proposing the deletion of Article 13 were not even subject to a vote. Article 13 of the copyright Directive contains a change of internet hosting services’ responsibility that will necessarily lead to the implementation of upload filters on a vast number of internet platforms. With dangerous potential for automatised censorship mechanisms, online content filtering could be the end of the internet as we know it. Disappointingly, the newly adopted Directive does not benefit small independent authors, but instead, it empowers tech giants. 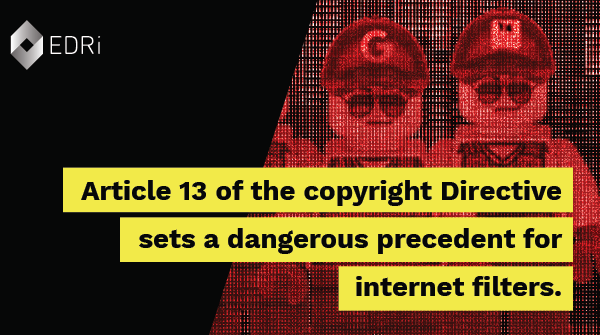 More alarmingly, Article 13 of the Directive sets a dangerous precedent for internet filters and automatised censorship mechanisms – in the EU and across the globe. European Digital Rights (EDRi) has long advocated for a copyright reform that would update the current EU copyright regime to be fit for the digital era, and make sure artists receive remuneration for their work and creativity. This Directive delivers none of those. EU Member States will now have to transpose the Directive into their national laws and decide how strictly they will implement upload filters. People need to pay special attention to the national-level implementation of the Directive in order to ensure that the voted text does not enable censorship tools that restrict our fundamental rights. Ahead of the next European Parliament elections, this vote comes as another important reminder of the impact that EU law-making can have on human rights online and offline. EDRi ensures the voice of civil society is represented in the EU democratic process and would like to thank all those involved in the battle against upload filters for their inspiring dedication towards the defence of fundamental rights and freedoms.